So, you’ve got a newborn or toddler. You’re getting the hang of this whole kid thing. You’ve got diaper changing dialed. Feeding’s a breeze. You’ve mastered meltdown therapy (as much as anyone can). Now you’re thinking it’s high time you had some outdoor family adventures, right? Good idea. But, you’ve run out of local parks to walk. You want something bigger. With bigger views. An adventure to remember. Maybe a state park, a national park. But, is it safe? Do they have family friendly trails? How do you find out? Standard travel and trail guides are useless. They inconsistently use the “family-friendly trail” designation. In addition, it only applies to kids over the age of 5, and as you’re well aware by now, little ones require a little more safety and care than older kids. OK, a lot more. So, what do you do? Easy. You buy yourself a copy of Hike It Baby: 100 Awesome Adventures with Babies and Toddlers on sale June 1st. Pre-order a copy now, or put it on your Father’s Day list. You’ll thank yourself. Seriously. This book is fantastic. 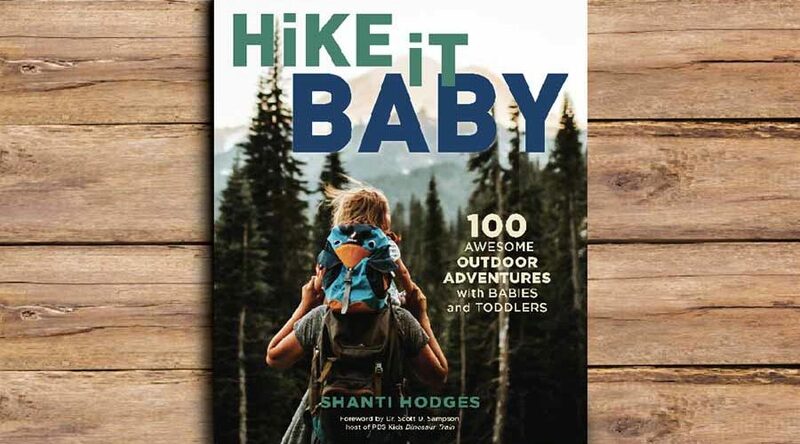 Hike it Baby maps out 100 outdoor family adventures across the U.S. you can take with babies and toddlers (no joke). Plus, everything you need to know about exploring the natural world. …and, well, 96 more destinations all over the U.S.
Not only that, but Dr. Scott the Paleontologist wrote the forward for the book, so you know it’s legit. Wondering whose brainchild this is and why no one’s put together a guide like this before? I can’t answer the second question, but here’s a little background on the first. SHANTI HODGES is on a mission to build communities, both online and offline, that help connect people to nature. In 2013 she founded Hike it Baby, a nonprofit dedicated to helping families with babies and toddlers find each other in the outdoors. In 2016 she began hosting an annual family camping festival (familyforestfest.com) in Oregon. Shanti and her husband Mark split their time between Portland, OR and La Verkin, Utah (Zion National Park area). She enjoys watching their son Mason fall in love with nature on their frequent adventures camping, rafting, biking, and of course, hiking in the outdoors. Shanti hopes to help families discover easy ways to connect with and enjoy nature as often as possible because she truly believes the love found there can change the world. Previous Previous Mindfulness For Kids. It’s Not Boring. Really.